Google has announced that users will now be able to use the Google Assistant in Hindi. The company notes that Assistant in Hindi is rolling out to all devices running Android Marshmallow 6.0 and above. However, the company notes that the feature would soon be coming to Android Lollipop, iPhones and Android Oreo (Go Edition) devices. 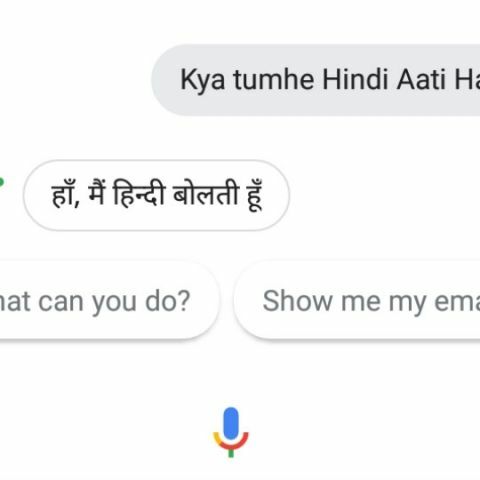 In order to access the Hindi Google Assistant, users will have to set their device language to Hindi, and update their Google Search app to the latest version. It should be noted that Google Assistant was available in Hindi earlier, but its features were limited. With the new update, users will be able to ask questions like “Sabse kareeb Punjabi restaurant kahaan hain?” or “Cricket ka score kya hain?” Users can even give it instructions such as “Kal subah mujhe saat baje jagaao,” or “Selfie kheencho.” There is also an official site where users can learn the different commands they can give to the Assistant in Hindi. You can access it by clicking here. Google Assistant in Hindi is already available in the company's Allo app and a special version of the Assistant was made available for the JioPhone.